Almost no man wears a necktie or suit. On the platform you find all kinds of musical instruments. Huge screens are mounted on the front walls, where the words of songs and scripture are projected. Many people in the congregation read Scripture from their phones. Worship leaders are often wearing jeans and sneakers. In the announcements, you hear of mission trips to foreign countries, regardless of the size of the church. Fewer and fewer hymns are being sung, and when the old ones are brought out, they’re given new treatments. Mostly, though, what’s being sung in worship was written in the past 10 or 12 years. Churches announce on their outside signs “blended” services, “contemporary” services, and/or “traditional” services. If you cannot adapt, you may find yourself living in the 1950s. The other weekend I worshiped with an interesting church in Jacksonville, Florida. I have not known that church previously, but had learned a little of their story before arriving. As the neighborhood changed around them, most of their members had moved away. Since the church failed to make the necessary adjustments to reach new residents of their community, it was slowly dying. So, not long ago, the remaining membership–mostly senior adults–asked a larger (and healthy, thriving) church in the area to take them over. They would be willing to make whatever changes were necessary to turn this around. That takes great courage, let me say. Most “older” churches cannot do this. The members are so wed to the ways of yesterday and the methods of the past that they prefer to let the church die rather than change. Six months after they called a young pastor from New Orleans to shepherd this transitioning congregation, I showed up for three days of ministry. As always, before and after preaching, I sat at a table drawing people. I was pleasantly surprised by the large number of children and teens and young families throughout the buildings. Already, the church is flourishing. The longtime members of that little church are having to get used to a lot of change. The pastor does not wear a suit or tie or even a sport coat. Music is provided by a group composed of piano, several guitars, and a drum set. Four or five young adults were the praise ensemble. It was a blessed service. The singing was great, the people were happy and friendly, and the fellowship was sweet. They’re getting this right. Being with such a happy group of God’s people was such a joy. What would happen, I wondered, if a member who moved back to town after a year’s absence walked into the service. A large screen flashes the words to hymns and choruses. The platform is covered by musical instruments, and an air of informality pervades. Churches are always changing. Only the dead ones don’t. May I repeat that? Churches are always changing–if they are alive. I guarantee you that Saddleback Church (Rick Warren) in Orange County is always tweaking what they do. As does North Point (Andy Stanley) in Alpharetta, and Celebration Church (Dennis Watson) in Metairie. But we see this same scenario playing out again and again. You’ve belonged to that church for many years. You were attracted to it because of location and ministry, because you liked the pastor and the people were friendly. You have served the Lord there in numerous capacities and your children grew up there. You have a history with that church. And now…. Now, it’s not the same church. There’s a new pastor and new leadership. They are attracting a different group of people from the lovely group that drew you in. You feel less and less a part of things. You’re not at home with many of the innovations they’re doing now. 1) Recognize that churches are always in a state of change if they are alive. 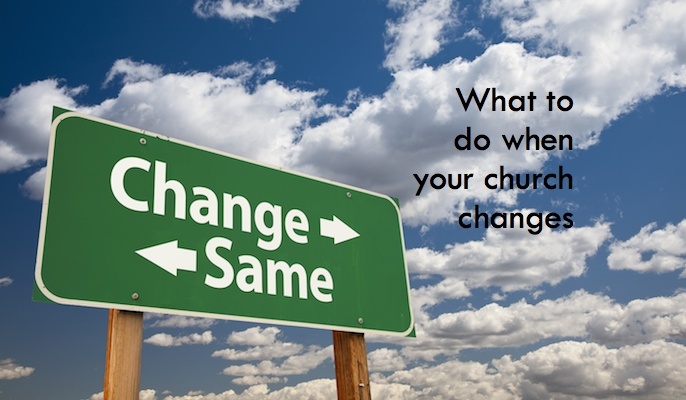 Everytime someone joins your church or leaves it, the church changes. Everytime a member begins to get serious about reading the Word or witnessing or tithing or ministering, or when they backslide, the church changes. It is never static, never a frozen entity. 2) You yourself are growing and changing if you are alive and obedient. I grew up on a certain kind of church music, then grew past that. Later, my tastes changed and to no one’s surprise, have changed again. 3) Your needs and requirements change. My tastes change. It’s called “life.” After radiation treatment of the head and neck a full decade ago, many things no longer have a taste at all, while others are as wonderful as ever. I can handle spicy food better than before since I have fewer functioning taste buds. Life is like that. 4) Perhaps you are dragging your feet and resisting something new the Holy Spirit is trying to do in your life. You are if you insist that the Lord do something again in the same way He did it before. You are dragging your feet and resisting Him if you reject the new things He sends because they are outside your comfort zone. Do you suppose Jonah felt comfortable going to Nineveh? Don’t you know it was way, way outside his comfort zone? 5) Perhaps the Lord has something new for you in the community and you should be in another church. This may be His way of cutting you loose from those ties that have bound you so you can move forward. 6) Are you open to new things? New ways? If you are not, you’re going to have trouble with the Lord Jesus. “Behold,” the Lord said, “I make all things new” (Revelation 21:5). He wasn’t just talking about Heaven, friend. 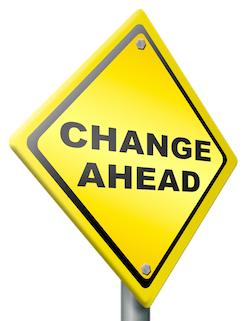 So, what do you do when your church changes? Grow with it. Joe McKeever says he has written dozens of books, but has published none. That refers to the 1,000+ articles on various subjects (prayer, leadership, church, pastors) that can be found on his website — joemckeever.com — and which are reprinted by online publications everywhere. His articles appear in a number of textbooks and other collections. Retired from “official” ministry since the summer of 2009, Joe stays busy drawing a daily cartoon for Baptist Press (www.bpnews.net), as an adjunct professor at New Orleans Baptist Theological Seminary, writing for Baptist MenOnline for the North American Mission Board, and preaching/drawing/etc for conventions and churches across America. Over a 42 year period, McKeever pastored 6 churches (the last three were the First Baptist Churches of Columbus, MS; Charlotte, NC; and Kenner, LA). Followed by 5 years as Director of Missions for the 135 SBC churches of metro New Orleans, during which hurricane katrina devastated the city and destroyed many churches. Joe is married to Margaret, the father of three adults, and the proud grandfather of eight terrific young people. He holds degrees from Birmingham-Southern College (History, 1962), and New Orleans Baptist Theological Seminary (Masters in Church History, 1967, and Doctorate of Ministry in Evangelism, 1973).